Helium is an interesting thing. It's quite rare on Earth, so wasn't even discovered as a thing until 1868, when astronomer Norman Lockyer found it in the sun. How did he find it in the sun when nobody on Earth had ever suspected such a thing even existed before? And why did he find it on the sun before anyone found it on Earth? Helium is the second element on the periodic table. This means that atoms of helium contain two protons in their nucleus. 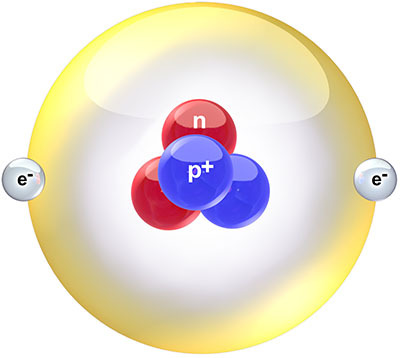 To hold these two positively charged protons together against their mutual electrostatic repulsion, the nucleus needs to contain either one or two neutrons as well, increasing the strong nuclear force to a point where it can bind the resulting group of particles together. Helium-4, with four nuclear particles (two protons and two neutrons), is by far the most common isotope of helium. Helium-3, with three nuclear particles (two protons and one neutron), makes up only about one ten-thousandth of the helium on Earth, and a few thousandths of the helium in space. Both isotopes are stable, neither undergoing any form of natural radioactive decay. Schematic diagram of a helium-4 atom. Creative Commons Attribution image by Bruce Blaus from Wikimedia Commons. The helium nucleus is usually surrounded by two electrons to balance the charge of the two protons, forming a helium atom. Helium atoms are almost completely inert chemically, not participating in any chemical reactions or forming any chemical compounds at all under most conditions. It is the first of the so-called noble gases because of this property. The reason for it is that the two electrons bound to a helium nucleus fill up the first available quantum energy level in the electrostatic potential of the nucleus. Any additional electrons are less tightly bound and easier to strip off by chemical processes, but the first two are held in a tight embrace. There's a bit more to it than just that, but that's good enough for now. Physically, helium atoms simply bounce around off one another, forming a gas at almost any temperature you care to name. Helium has the lowest boiling point of any material, turning into a liquid only at -269°C, just 4 degrees above absolute zero. As a gas, helium is also very low in density (although hydrogen beats it as the least dense gas), and is lighter than air, so tends to rise. This property is made use of in helium party balloons and gas-filled airships and blimps. A cubic metre of helium can lift just a little over one kilogram of mass; a thousand cubic metres of helium (roughly the volume of a large house) can lift a tonne. Hydrogen can lift a little bit more (about 8%), but is highly inflammable, as was tragically demonstrated by the Hindenburg disaster. 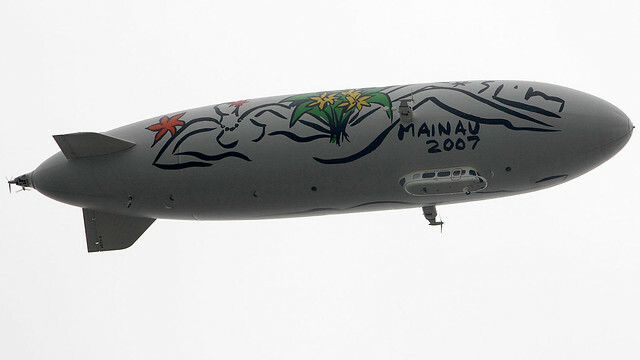 So helium is the lifting gas of choice for modern airships. Modern airship, flying over Friedrichshafen. Airships and party balloons however make up only a very small fraction of the usage of helium. Most is used in industrial applications. The greatest fraction of helium usage is in cryogenic applications, where liquid helium is used to cool equipment which needs to operate at very low temperatures. Many superconductors require such temperatures, and helium is used to cool superconducting magnets in equipment such as hospital magnetic resonance imaging (MRI) machines, particle accelerators, and magnetic levitation transport systems. Other uses of helium make use of its chemical inertness. Such applications include: as a shielding gas in welding, so that the hot welding material doesn't form undesirable compounds with the atmosphere; as a gas for flushing pipes or pressure vessels of other gases; as a gas atmosphere around growing silicon and germanium crystals produced for semiconductor electronics; and as a mixing gas with oxygen to produce breathing gases for deep sea diving, to remove the dangers of nitrogen narcosis from breathing pressurised nitrogen. Helium also has a very high thermal conductivity and heat capacity for a gas, so is used in other applications where heat properties are important. These include in wind tunnels, refrigeration, and heat transfer for things like cooling nuclear reactors or electronics. Helium's low density affects the speed of sound, which is about three times higher in helium than in air. This changes the pitch of the resonant frequencies of your voice if you speak while exhaling helium, causing the voice to sound high-pitched and distorted. Some care needs to be taken not to breathe helium repeatedly over a short time, to avoid asphyxia from lack of oxygen. When released into the atmosphere, helium, being less dense than air, migrates upward. Atoms of helium eventually reach the rarefied upper levels of the atmosphere. Being in thermal equilibrium with the rest of the atmosphere, the helium atoms have the same average kinetic energy as the much heavier nitrogen molecules and oxygen molecules (each made up of two atoms of nitrogen or oxygen respectively). But the atomic mass of helium is 4, while the atomic mass of nitrogen molecules is 28 (two times 14), and oxygen molecules is 32 (two times 16). So on average helium atoms are travelling almost three times as fast as other constituents of the atmosphere. This is an average of a velocity distribution - there are some high speed nitrogen and oxygen molecules,but there are a lot more high speed helium atoms. Distribution of speeds of various gas molecules in Earth's atmosphere. Looking at speeds above 2000 m/s, you can see a significant number of hydrogen molecules and helium atoms have speeds this high, but virtually no molecules of water vapour, nitrogen, or oxygen do. (Escape velocity from Earth is actually 11200 m/s, but this plot is for room temperature, while the temperature at the top of the atmosphere is higher.) Creative Commons Attribution-NonCommercial-Share Alike image by UC Davis from UC Davis ChemiWiki. Earth's gravity holds on to our nitrogen and oxygen atmosphere over geological time periods, because very few of the nitrogen and oxygen molecules in the upper atmosphere have enough velocity to escape. However, the much higher speed distribution of helium atoms has a significant number of atoms above Earth's escape velocity. So they leak away into interplanetary space. And to maintain the temperature equilibrium as these hot helium atoms leak away, the cooler helium atoms have to warm up to higher speeds, so more of them leak away. This happens so fast that there is virtually no helium at all in Earth's atmosphere (just a few parts per million), with pretty much all that there ever has been having leaked away to space billions of years ago. It also means that any helium we use which ends up leaked into the atmosphere will be lost to space within a very short time, just a few years. The tiny residual amount of helium in our atmosphere is far too little to be able to be extracted usefully or economically. And this is why helium was first discovered not on Earth, but in the atmosphere of our sun. The amount of helium in Earth's atmosphere is too small to have been noticed up to the late 19th century. By this time, chemists and physicists had observed that different chemical elements produced characteristic patterns in spectra of visible light. If you shine a light through a gas containing a particular element, that element absorbs light in a very specific set of wavelengths. These wavelengths correspond to colours and form thin, dark bands across the spectrum of the light when it is spread out by a prism. The pattern of lines is consistent for any given element, and distinct from the pattern of any other element. In 1868, French astronomer Pierre Jules Janssen was visiting India to observe an eclipse of the sun. The moon blocking the main disc of the sun gave astronomers the opportunity to observe the corona, or atmosphere of the sun. In his spectra, Janssen noticed, among other lines, a dark line in the yellow region. He thought it was caused by sodium, which has lines nearby and was known to exist in the sun's spectrum. Later in the same year English astronomer Norman Lockyer noticed the same line, but realised that it wasn't in the right place for a sodium line. The line corresponded to no spectral line of any known element. He concluded that the line must be caused by some hitherto undiscovered element. In consultation with chemist Edward Frankland, they decided to name the element helium, from the Greek word for the sun, helios. Helium spectrum, showing the bright yellow line first detected by Janssen and Lockyer. Public domain image by NASA from Wikimedia Commons. It wasn't until 14 years later, in 1882, that helium was detected on Earth. Italian physicist Luigi Palmieri found the tell-tale yellow spectral line in a vaporised sample of lava from Mount Vesuvius. It showed that there was some helium trapped underground. 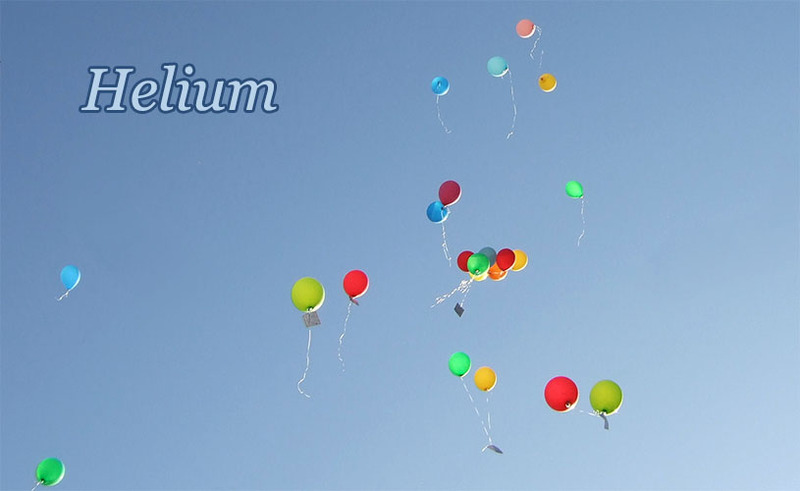 It took another 13 years until a sample of helium was extracted so that it could be studied. Scottish chemist Sir William Ramsay was looking for the gas argon trapped in a sample of a mineral called cleveite, a type of uranium ore. He dissolved some of the ore with acids and collected the gas which bubbled off. He then separated off the nitrogen and oxygen which he expected to be produced, and tested the remaining gas for argon using spectral analysis. As well as the argon, he noticed the distinctive yellow spectral line of helium. Why is this gaseous element which doesn't form compounds with anything, and which if released to the atmosphere floats up and escapes to space within a relatively short number of years, found in rock samples underground? When the Earth formed, it coalesced out of our sun's protoplanetery disc, gathering dust and gas together with its growing gravity. It attracted heavier elements like iron and silicon and oxygen and molecules like water, but at no stage was Earth's gravity high enough to attract significant quantities of helium. Any helium drawn near would have stayed in the proto-atmosphere, rather than being drawn down underneath the heavier elements, and from there leaked away again quickly to space. Yet today we can find helium in rocks retrieved from underground. How did it get there? The fact that helium had been found in samples of lava and in a radioactive uranium ore is significant. Some of the elements drawn to the coalescing early Earth were things like uranium and thorium and radioactive isotopes of potassium and so on, generated by the supernova explosions the littered the interstellar medium with heavy elements. These elements were captured in rocks as the Earth solidified. The radioactive isotopes slowly decayed over time, and much of the uranium-238 is still decaying as it has a half life of 4.5 billion years. I've talked about the three types of radioactive decay before: alpha, beta, and gamma decay. The important one now is alpha decay, in which a nucleus ejects an alpha particle composed of two protons and two neutrons, thus lowering the radioactive isotope's atomic number by two. In this way uranium-238 decays to thorium-234. The thorium goes on to decay via a series of cascading alpha and beta decays until the nucleus eventually ends up as the stable lead-206. But we're not interested in the nucleus... The question is, what happens to those ejected alpha particles? An alpha particle, as just mentioned, is two protons and two neutrons. Sound familiar? If you add two orbiting electrons, you have an atom of helium. As radioactive elements in our rocks decay, the alpha particles they emit pick up electrons from the surroundings and become helium atoms. This is where our helium comes from. It is generated in rocks, underground, by the radioactive decay of heavy elements Earth collected when it formed billions of years ago. Some of the helium atoms formed this way are trapped inside the rocks where they formed, which is why traces of helium can be found in radioactive ores, or occasionally in samples of lava. Additionally, some of the helium atoms can migrate through the rocks, seeping through cracks. Some of it escapes from the ground into the atmosphere, and from there its fate is assured: drifting upwards and eventually off into space. But there are places underground where gas collects. Some types of rock are quite impervious to gases, and when layers of these rocks are buckled by geological processes, they can form folds underneath which gases (and liquids) can be trapped in permeable rock layers below. 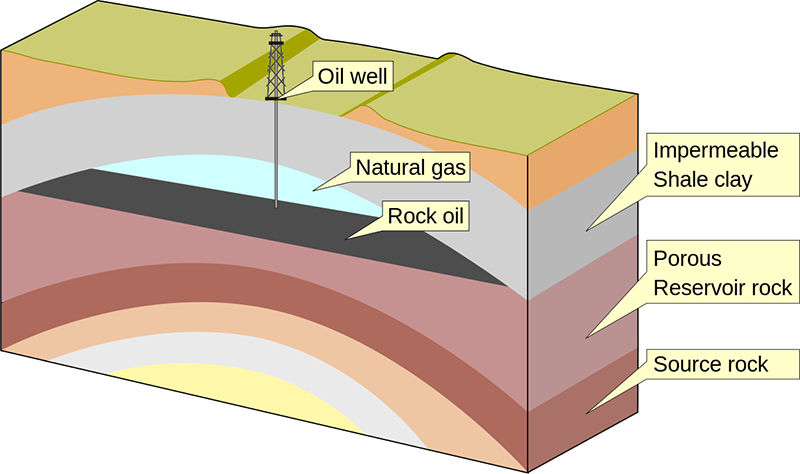 Petroleum, natural gas, and helium trapped in an anticline rock fold. Creative Commons Attribution-Share Alike image by Wikimedia Commons user MagentaGreen from Wikimedia Commons. We call such traps petroleum and natural gas deposits, and over the past century or so we have eagerly sought them out for the petroleum oil and gas we use for fuels. When extracting natural gas, typically 0.1 to 0.5% of the gas is actually helium. This helium is separated and compressed for storage and transport. And this is where all of the helium that we use comes from, as a byproduct of natural gas extraction. There are no other commercially viable sources of helium on Earth. The helium trapped in these gas deposits has built up, atom by atom, from the radioactive decay of heavy elements, over billions of years. The rate of production is so slow that once we use up what's there, we will have no more ready supply of helium. This is a serious concern, because at the rate we are extracting and using it, the supply will run out in the foreseeable future - within about 50 years at current estimates and rate of consumption. And once it's gone, it may be difficult to run machines like MRI imagers in hospitals, among other things. For this reason, many people argue that we should be taking drastic steps to conserve and ration our helium supply, to make it last as long as we can. In this light, using helium for party balloons seems a bit unnecessary, compared to running machines which can save lives. Once the helium trapped underground is gone, there is no economically viable way for us to get more. It would be possible to mine uranium and refine it just to collect the alpha particles, or we could extract the scant few parts per billion of helium that remain in our atmosphere, but either method would probably end up costing millions of dollars for enough helium to fill a party balloon. There is one other option. Helium is very rare on Earth, but it is the second most abundant element in the universe. There are enormous amounts of helium in our solar system - most of it in the place where it was first detected: the sun. The gas giant planets also contain a lot of helium, roughly 10% of the volume of Jupiter and Saturn, and somewhat more of Uranus and Neptune, is helium. These planets are large enough that their gravity does not let go of helium as easily as Earth, and they have retained most of their quota over the lifetime of the solar system. An even easier place for us to get helium is, oddly enough, our moon. Although it has no atmosphere, this actually makes the moon a better place for finding helium than Earth. The particles of the solar wind impact the moon's surface continually, embedding themselves in the lunar soil and rock. This leaves helium nuclei concentrated in the lunar surface rocks at almost 30 parts per million - nearly six times the abundance of helium in Earth's atmosphere. But it may be more lucrative to mine the moon for the much rarer helium-3 isotope than for garden variety helium-4, since helium-3 is a potential fuel isotope for nuclear fusion. But mining the moon for helium is a long way off, technologically and economically. By all sensible measures, helium should be a resource we value much more highly then we presently do. The low global price of helium is an artefact of the US government's helium reserve policy. The US has a large stockpile of helium extracted from gas fields since 1925, and releases helium from this to keep the price low. If we were using helium at the rate it is currently being extracted, the price would be much higher due to the laws of supply and demand. Eventually the US stockpile will run out and the price of helium will climb inexorably higher as our underground reserves dwindle. 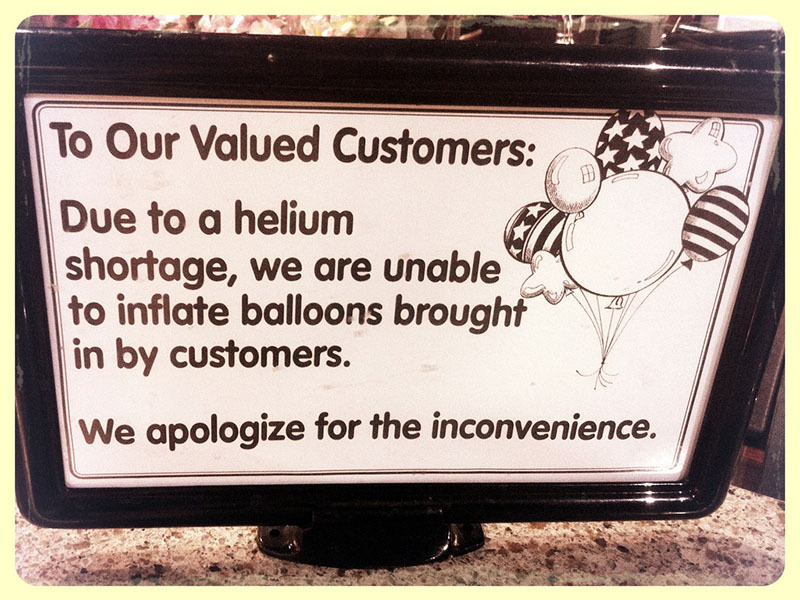 Helium shortages are already being felt. Creative Commons Attribution-NonCommercial-Share Alike image by Mark Beeson. Helium will be far too expensive to use for party balloons. The limited supplies will be rationed off to medical and critical industrial uses. And one day we'll run out. It could easily be within a few decades. Let's hope we have the determination and technology to get into space and get access to more helium before we have to stop using it to help sick people. Title photo: Creative Commons Attribution-NonCommercial-Share Alike image by Anke L.
 Helium can form highly unstable molecular compounds when severely maltreated, such as being forcefully ionised and subjected to concentrations of highly reactive elements, or when subjected to immense pressures. But for all sane practical purposes, helium simply doesn't form compounds. Last Modified: Sunday, 5 April 2015; 03:11:10 PST.